It’s a bit unusual that, in preparation for our next Airstream trip, we are mostly unloading the trailer. That’s because we haven’t fully finished reconfiguring our Airstream from its former role as full-time home, to its new role as escape pod. The compartments are somewhat unloaded, but many things still remain tucked away in the corners that really should come out. I want to travel a lot lighter than we have in the past. Not because this will improve our fuel economy, and not because we were overweight, but simply because life is easier in the trailer when there’s less stuff to dig past in order to get to what you need. It will be nice to have storage areas that have free space, instead of being packed to the absolute limit. We’re not going to be needing that snorkel gear in the southern California desert anyway. I’ll appreciate being able to get to the bed without stepping over my ukulele. Finding the beef jerky for a hike will be nicer when there’s no heap of summer clothing stored on top of it. And on and on it goes … every space in the trailer is getting overhauled, and all of the “we might need this” stuff is coming out in favor of the “I plan to use this next week” stuff. This is fun. 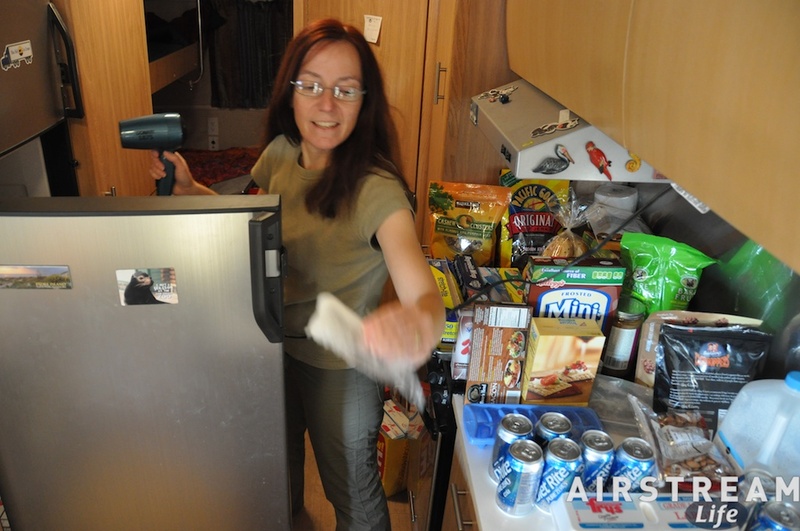 Instead of packing food for every contingency and having to cut package down in size to fit, Eleanor is just tossing in the full size packages of the things we plan to eat in the week-long trip that is planned. We’re bringing only the games we want to play, the clothes we want to wear this week, the books we are currently reading, and we’re putting the rest into storage bins in the house. For example, this time of year it’s hard to find reliably warm weather anywhere, and the southwestern desert is certainly not immune to cold. No snowstorms are expected in the low desert that we travel, but nights will be near freezing. A rapid 35 degree drop in temperature after sunset is not unusual, so our clothes for this trip have been chosen with layering in mind. The upside of the winnowing process is not the hundreds of pounds of stuff we have removed, but more rather that we’ve simplified life yet again. Simple is good when you are going on vacation, and that’s the mental mode I want to capture with this trip. Usually it’s work and play combined. This time the work will be kept to a minimum while the play stuff takes over. Eliminating the unnecessary has made room for a few bulky luxuries that we haven’t traveled with in years: the Weber grill, the folding bicycles, folding chairs, and the waffle iron. Part of the fun is the anticipation of the trip, and the anticipation can be strengthened by the process of picking out the things you’ll need for the things you’ll do. I can already see us hiking up a canyon in search of a palm oasis and bighorn sheep (note to self: remember hiking boots, backpacks, trail snacks, water reservoirs). I’ll have fun snapping pictures (remember to pack all the camera gear) as we discover interesting bits of geology, history, and botany along the trails. In the evening we’ll grill out by the awning (pick up portobello mushrooms and peppers at the grocery), and watch the bright stars as the coyotes howl (binoculars, tripod, headlamps, folding chairs, warm sweaters). In the morning we’re going to experiment with a new waffle mix and serve ’em with real Vermont maple syrup. We are fortunate to have a full hookup in our carport. This makes pre-trip prep a lot easier. The trailer has been sitting since we got back, and there’s some cleaning to be done. Eleanor defrosted the refrigerator quickly before we started repacking it, and I did a little mopping up of the desert dust that always accumulates even in closed spaces. (In the photo above, she’s chucking a piece of ice from the refrigerator into the sink.) A quick check around the Airstream shows that everything is still operational except for a single bulb that burned out, so the prep is minimal this time. The last simplicity accruing from this change in perspective is the ease with which this trip has come together. Focusing solely on a closed-ended and brief trip, we have had to put less brainpower into the planning and packing. Preparing for our last seven month voyage took weeks of prep, shopping, packing, and planning. It’s so much easier for this trip. We need only pack for one season, one place, one week, and one intent: have fun and relax. Although I can’t wait to get going, these days leading up to departure are fine too. Here’s another question I often am asked: What does it cost to live on the road? I think a lot of people ask this question because they assume that a life of travel has to be an expensive luxury. This isn’t surprising, since (at least in the USA) most people’s view of free time is tied directly to the concept of “vacation” — and it isn’t a vacation unless you go somewhere and spend a lot of money. It takes a little re-arranging of the brain space to grasp that full-time travel via an Airstream can be a really economical experience. Some people try, and fail miserably, having spent many times more on fuel, admission tickets, and “supplies” (read: souvenirs), just like their vacations. But I’m here to tell you that not only can it be cheaper than living in a stationary house, it can be a life-saver. 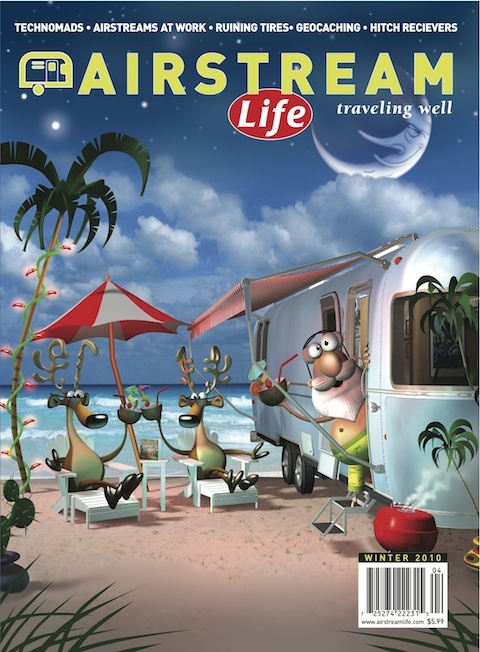 See, when I started Airstream Life magazine, I was severely under-capitalized: the curse of many small business entrepreneurs. After a year of running the small and unprofitable business, it was clear that we needed to reduce our living expenses if our savings were to last long enough to reach profitability. And our largest expense by far was the upkeep of our house. The house was eating us alive, with mortgage, substantial taxes, maintenance, utilities, snowplowing, garbage collection … while we were traveling about 5 months per year on business. So after some consideration, we decided to sell it and live on the road for a while before building a smaller house. A summer of living in our Argosy 24 turned into 36 months of life in our Airstream Safari 30. Along the way we discovered that life in the Airstream was not only a lot of fun, but much more affordable than life in the house had been. And that made all the difference. 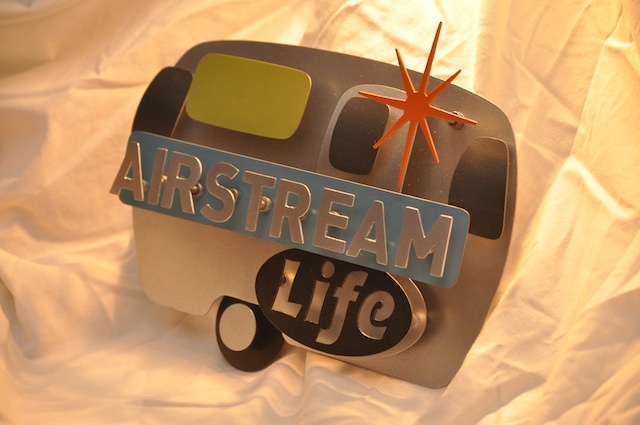 I could not have succeeded with Airstream Life if we hadn’t lived on the road for three years. Without the crushing burden of a house, we were able to stretch our savings to permit years of travel — combining a once-in-a-lifetime experience with a smart financial move. Of course, we took care to ensure to cut our travel expenses whenever possible. We saw people run through $50,000 in a year traveling by RV, and we saw people doing it on as little as $20,000 per year (and having the same amount of fun). So we tried to emulate the folks who were having a frugal but wonderful time. The “tricks of the trade” aren’t really tricks at all. They’re just common-sense choices that you can make along the way, like limiting your driving. There’s usually no need to zing back and forth across the country, but as I’ve said before, this is one of the top mistakes made by new full-timers. One of our very best months was spent in the Four Corners region (CO, UT, AZ, NM) where we visited fourteen national park sites on a budget of $971. You don’t have to spend a lot to experience a lot. Why was it so cheap? First off, we rarely splurged on full-hookup campgrounds. Instead, we prefer to stay in the national park campgrounds whenever possible. They’re more natural, better located, and cheaper, in exchange for the trade-off of generally lacking the amenities of commercial campgrounds. Second, we limited our travel. We stayed several days in most locations, and never towed more than 100 miles. When we found a good place, we stayed a while. Staying put is always cheaper than towing somewhere else. 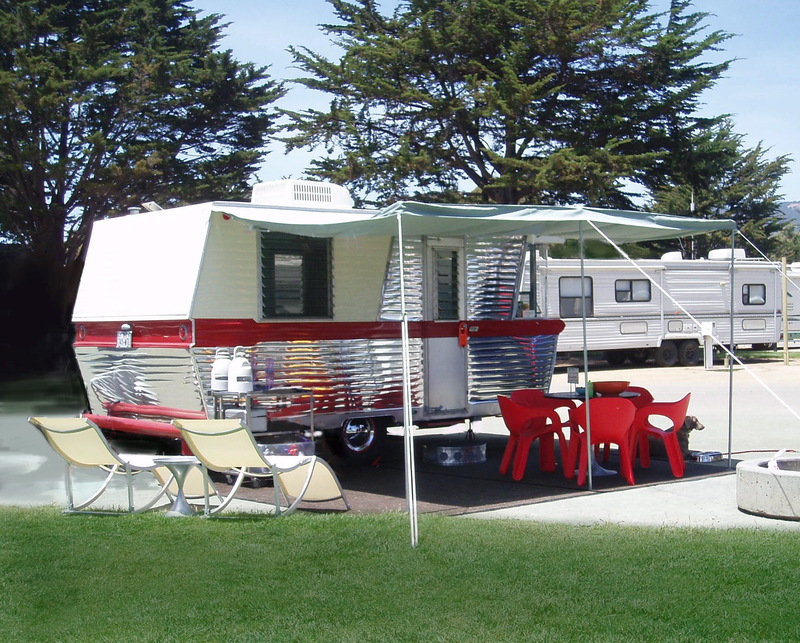 Although we rarely stayed as long as a month, you can really save a lot of bucks with campground monthly rates. Third, we didn’t buy anything except necessities. Our souvenirs are strictly limited (because of space limitations too! ), so early on we decided what we’d collect. Eleanor buys a national park pin in almost every park we visit. Emma sometimes gets one too, or a book, in addition to the Junior Ranger badge she usually earns. We don’t buy logo apparel because we really don’t need it and the trailer would quickly fill up with the stuff. (After all, we’ve visited well over 150 national park sites.) We avoid the cute gift shops in town, and when we do buy something local, it’s most often edible. I know a lot of people like to shop as they go, and I’m not saying you can’t do that, but you can’t expect a habit like that to be cheap. Related to this, we were also careful to limit eating out. It gets expensive quickly, not to mention the rapid impact on your waistline. This is tougher than it might seem, because everywhere you go, there’s someone who wants to celebrate your arrival (or your new friendship) with dinner out. Fourth, we took full advantage of the great deal that our nation’s parks offer. For $85 per year we have free admission to every US national park in the world, including the ones in Guam, American Samoa, and the US Virgin Islands. It’s a deal like no other. If you are over age 62, the deal is even better: $10 for a lifetime pass. Don’t miss it. Fifth is the Big One: We sold our house. You can’t leave cheaper on the road if you still have a house somewhere. The house stills costs even if you don’t live in it, doesn’t it? The only ways to make the economic formula work are to sell the house or rent it out while you are gone. We calculated the cost of owning our house at about $65 per day. Once we had that burden lifted, it was easy to cost-justify the Airstream and the tow vehicle. You’re even better off if you don’t have a loan on those vehicles. “The cost of travel” is a red herring. The cost of staying at home is the unspoken and dangerous story. Unspoken, that is, until the recent mortgage crisis revealed how many people were living far beyond their means in the name of “home ownership.” Dangerous, in the sense that if too many people realized how much better off they might be without the trappings of suburbia, the housing market could collapse further. Not everyone can break away from their current responsibilities and travel, but if you are lucky enough to be able to travel — even for a week or two — yes, you can live on the road and save money.